“Mardi Gras season is a great opportunity for our Marines to embrace the unique culture and traditions that this city has to offer. The Marine Forces Reserve Band and members of our color guard details participate in numerous balls and parades throughout the city. We are grateful to share the experience and interact with members of our community every year,” said 1st Lt. Kristine Racicot. During the 2019 Carnival season, the Reserve Band will be led in at least 13 parades by Staff Sergeant Keith Algeo, the Reserve Band drum major. All of this marching will be conducted with perfect posture, wearing immaculate dress uniforms, and carrying heavy instruments while playing to an exacting standard. Marines march — they do not walk — eyes front over unseen potholes, past pushing crowds and amid flying beads. Marine Corps Reserve Band New Orleans, founded in 1978, has become an interval component to New Orleans festivities in the 40 years since its creation. Over 100 years of history intertwine the U.S. Marine Corps and Mardi Gras. 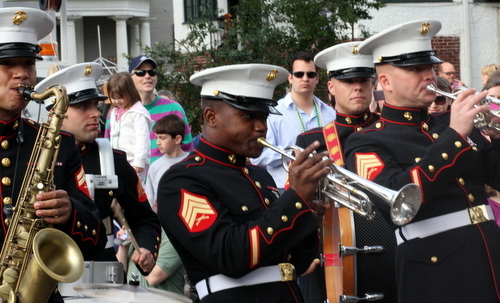 New Orleans is a military friendly city, and numerous local Marines attend Carnival balls in full dress uniform as honored guests, as well as attending the city’s parades and parties. In 1964, 73 members of the 2d Marine Division Band marched down St. Charles Avenue on Mardi Gras day. The band was housed on board the USS Lexington moored on the Mississippi River at the Dumaine Street Wharf. In 1906, a battalion of Marines from the U.S. Battleship Texas marched beside Rex himself on Mardi Gras Day, per the Times-Democrat. The Rex organization touts a longstanding connection to the military and military service and features the Reserve Band at its the annual ball. “The Marine Band plays an impressive musical program before the court, the highlight being when the band performs the hymn of each military branch,” per the krewe’s website. 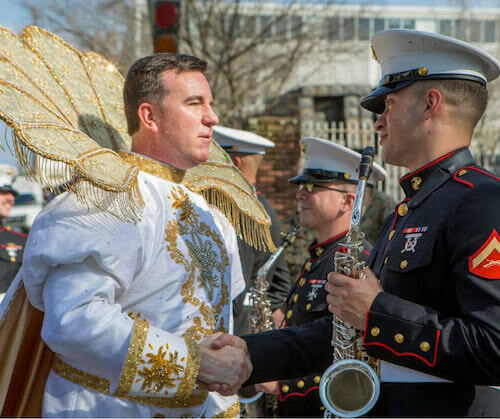 In addition to Mardi Gras festivities, the Marine Forces Reserve Band performs over 350 concerts, parades, and ceremonies before more than 8 million people annually. The band includes several ensembles: the Concert Band, which utilizes almost every musician in the unit and the largest ensemble of the band. The Ceremonial seen at sporting events and half-time performances, the Jazz Combo, a Woodwind Quintet, and the favorite, the Big Band modeled after the Glenn Miller and Count Basie orchestras. The latest formation is the Marine Corps Reserve Rock Band. Marine Forces Reserve Band New Orleans is one of 10 Marine Corps fleet bands. The unit is comprised of active duty Marines stationed at the Marine Corps Support Facility in Algiers. Per the band’s website, New Orleans is the Marine Forces Reserve headquarters command for approximately 100,000 Reserve Marines and 160 Reserve Training Centers located throughout 47 of the United States, Washington D.C., and Puerto Rico. 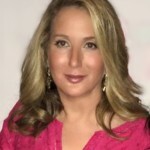 Kristine Froeba is a fourth-generation Uptown girl whose varied background includes food and travel writing, celebrity ghost writing, public relations, social media management, fundraising, preservationist, reluctant tabloid hack and litigation specialist. She describes herself as part foodie, part writer, part historian, historic renovation zealot and full-time dabbler.